Sid signs frequently asked questions page. Need more information? Check to see if the answer to your questions can be found in this section. Who buys these SID systems? Our SID sign systems are suitable for private roadways and public highways. Used by parish & county councils all sid devices have an automatic night dimming feature for safe night time use; essential for public roads. Private companies and government departments also buy our systems for use on industrial parks, private roads or military bases. I am not VAT registered, can you help? Yes. If you aren't registered for value added tax so cannot reclaim your 20% VAT then please contact us to see if you qualify for our VAT free sales scheme. Yes. All speed indication devices are provided with a comprehensive guarantee for a period of two years via a return to base warranty. Why are your prices so much cheaper? All products are manufactured from raw materials without the need for outside help or sub contractors. 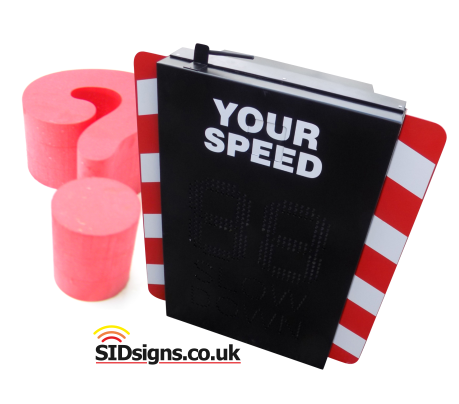 We can make any speed sign system more cost effectively than competitors who buy everything in from someone else. There is no mystery, there is no catch. Do you use cheap materials? No. We are one of the only speed sign sites offering systems made from high quality welded aluminium. Compared to plastic or mild steel the materials we use are, in fact more expensive. The all important traffic detection devices which are the "brain" of any speed indicator are sourced at component level from suppliers in a European country with a reputation for precision and reliability. Can we ask you to tender? Yes. If you have a purchasing requirement which has to go out for tender you are welcome to submit documentation to us. Custom requirements such as special designs, colours or vinyl graphics can be accommodated. Flight cases are available as are CNC machined packing crates. Can we get a volume discount? Yes. If you need to purchase a number of speed indication devices we are happy to discuss discounted prices. Can I hire a SID system? Yes. If you need to use a SID system for a temporary project then a hire service is available. If you decide you would like to keep hold of your hired speed indication system all hire charges can be deducted from the price. Do you offer onsite services? If required we can send service engineers to site.